Over the last two decades, Soundcraft has earned a well-respected reputation for the design and manufacture of high performance professional audio consoles for a variety of applications. 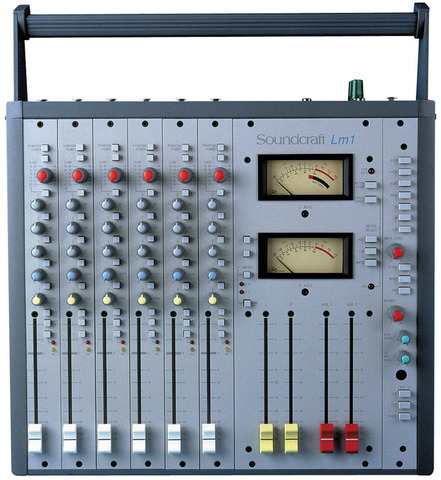 The use of experienced specialist designers coupled with Soundcraft’s modern manufacturing techniques using the highest quality components have resulted in a range of consoles which provide the facilities and specifications demanded by the world’s top broadcasters, production companies and sound recordists. Available in three frame sizes for 6, 8 and 12 inputs, the LM1 is designed to meet the demands of location sound recording for the film and broadcast industry. It offers performance and features to satisfy the most exacting requirements. Robust construction combined with minimum size and weight allow the LM1 to be easily transported to the most remote location, where high gain, low noise and long battery life guarantee the best results under the worst conditions.